I'd really like to be able to say Insidious is a groundbreaking album. 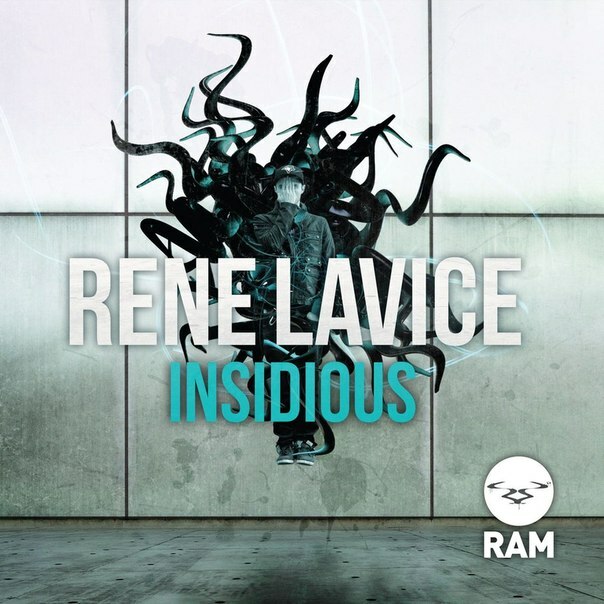 Rene LaVice is one of my favorite new drum & bass producers, and I've been drooling over the thought of a full-length album from him ever since "Headlock" came out about this time last year. What's more, "Headlock" was a deviation from the norm for an often sluggish RAM Records, and after safe releases like singles from Culture Shock, Wilkinson, and Delta Heavy the song came at a perfect time for the label. It also helped that on the same EP was June Miller's incredible "64 Thousand Dollar Habit," but no matter - Rene LaVice set the stage for himself quite excellently with that song, and unsurprisingly RAM signed him exclusively a few months later. The release of a good Absolute Monster EP this past summer helped to heighten expectations for the album, as the EP showed off LaVice flexing his producer's muscle with five dark, expertly controlled DnB tunes, showing the young producer taking a step towards oft-untrodden frontiers of the genre. All this contributes to the fact that I wanted - nay, presumed - Insidious to be chock-full of fresh and innovative music. Many listeners think of Rene LaVice as a potent force against the stagnation of the genre of which he is a part, and he was expected to champion the forward-thinking sound he had previously put forth by accomplishing the Herculean task of injecting a crisp new sound into his music over the course of 14 tracks. Disappointingly, then, the album is stuck in a rut. The inventive wobbles present on "Headlock" and Absolute Monster aggressively take over the spotlight for much of the album, and Insidious suffers from it. That's not to say it isn't good - this is one of the best full drum & bass releases in recent memory, especially considering the stale nature of the genre. And, to be fair, LaVice produces some excellent songs far away from his typical style - for example, "Vicecream" is quite poppy with its light, plucky synth lead in fifths with the bassline, and the producer pulls off this poppy sound quite well. It just feels like LaVice could have done so much more with expanding his sound. Whether it's "More Wore," which utilizes the producer's standard darker wobbles and drums, "Tap Dat," which, though only coming two songs later borrows much of the same ideas found on "More Wore," or any number of other songs, there's just a tad too much "sameness" on Insidious. The inclusion of two songs - "Dank" and "Absolute Monster" - already released on previous work doesn't help the "sameness" idea much, as this inclusion suggests LaVice had begun to run out of material before the completion of the album, and threw in those two tracks to pad the length a bit. The use of vocal tracks alleviates the homogeneity a bit, but the three songs with vocals serve to polarize as they are either some of the best material here or some of the worst. "Insidious" falls into the former category, with disorienting drums and vocals from Ivy Mairi complementing the ominous feel of the instrumental behind her quite well. Unfortunately, both "Rude Selection" and "The Way You Love Me" are boring, with the added problem of horribly jarring vocals (and, in the case of "Rude Selection," vocals that serve only to reinforce negative brostep stereotypes). "Rude Selection," though, while most certainly not representative of the best work here, is a good portrayal of what went wrong with the album - it feels like most of the material has been done before. Songs like "This Is A Conflict" and "Vicecream" notwithstanding, Rene LaVice's trademark sound with which he wooed us all feels slightly overused, even though every song is immaculately produced, dark, and heavy. Insidious is a good album, make no mistake, and if it's indeed stuck in a rut it's stuck in the best possible way. Unfortunately, we all expected something slightly less safe.